What a horrid shock the weighing scales have given me this morning! After a complete week of Navratra fasting, I thought I’d have lost at least 10 kg. Instead, the stupid machine is showing that I’ve gained 5 kg. Aap batao, how can that be? For seven days, I haven’t put a single grain in my mouth — no rice, no chapatti, and adhered to all the fasting rules.I mean, look at the emaciated bodies of the wandering, fasting ascetics and look at my body. Basically, we’ve been through the same rigors, haven’t we? Then why the difference?Is this a curse of Mahishasura? Hey Mata Rani! Tera hi aasra! What have I eaten after all? I would start the day with a glass of milk to fortify myself with a full day of fasting. Then I would have some fruit. After which it would be either saboodana khichdi loaded with fried peanuts and fried potatoes (totally vegan, so can’t be fattening) or a kuttu ke atte ka parantha stuffed with paneer and fried in desi ghee, with a dollop of butter on top. Kuttu ka atta is a bit dry, you see, so you must lubricate it with healthy fats. The operative word being ‘healthy’ and everyone knows that ghee and butter is healthier than refined oil. I would have a glass of thick saffron lassi to complete my breakfast. Sweet, naturally! Sweet gives an energy kick that’s so essential for a person on a long fast. Snacks mein one can’t have the normal namkeens or sandwiches or cakes if one is serious about the fast. So, I had purchased many packets of potato chips, laccha aloo, til aur gur ke laddoo. I also fried 1 kg kaju and 1 kg badam and bought raisins and dates to help me through the days of abstinence. And fruits toh hain hi, thank god! For lunch, I would make some paneer with singhare ke atte ki pooris and mango lassi. I specially learnt how to make almond halwa for this fast. So, I would make either that or coconut laddoo or saboodana ki kheer for dessert. Tea time pe it was either aloo cutlets or fried shakarkandi chaat. You can’t even eat regular vegetables or daals. Garlic and onions too bow out for those nine days. I fail to understand that with such limitations on food, how can anyone possibly put on weight? 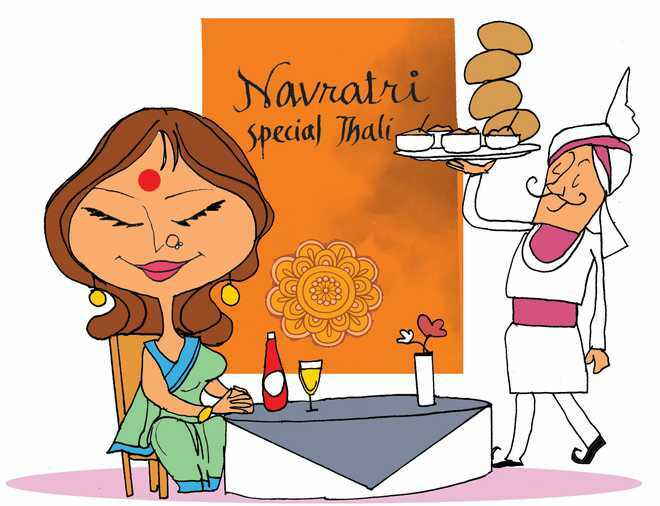 For dinner, we would go out to different restaurants serving Navratra thalis. We even discovered that some pizza outlets were offering vrat wala pizzas and tried them out. The base made from singhara atta didn’t taste great, but coke helped down it. Once I made vrat ke chawal ka pulao to which I added lots of fried nuts, and yes, those eternal fried aloos. It was followed by singhare ke atte ka halwa for dessert. Everyone liked it. But I’m still wondering about the unresolvable mystery of weight gain. I think I’d better have my thyroid checked. It’s got to be a thyroid malfunction. There’s no other logical explanation.